Looking for something, well, AWESOME to do with your turkey leftovers? Paella, that most quintessential Spanish dish. If you've never had paella, it's a rice dish seasoned with saffron, onion, tomatoes, and just about anything else you want to add. It is a hearty meal best shared with family and friends, (can you say hygge) and, in our case, we decided to use leftover turkey in lieu of chicken. We also decided that paprika-laden Spanish chorizo (not to be mistaken with Mexican chorizo) would be absolutely amazing with the smokiness of the turkey and, of course, there had to be shrimp! It's a great one pan dish and although we are total kitchen gadget junkies (yes, we own a paella pan) I used a heavy skillet for this iteration and I cooked it on the stove top instead of the the turkey fryer burner we use during the summer months. It takes about 15 to 20 minutes of prep time and 30 to 45 minutes cooking time, so it really can be dinner in an hour and it will blow your family and friends away! There are a few specialty ingredients you'll need to make a proper paella. The aforementioned Spanish chorizo being one. Do not confuse this with Mexican chorizo, the Spanish version is a salami-like sausage seasoned with paprika and can be cut into cubes or thin slices. 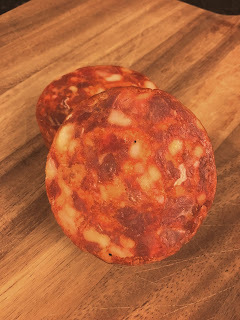 Boar's Head makes a Spanish style chorizo which we use since there isn't a Spanish market anywhere near us. Boar's Head is quite good and I've been very happy with it . A friend mentioned there's a great online Spanish market called La Tienda where you can get chorizo, if there isn't any available near you. The second specialty ingredient you'll need is saffron. This incredible spice is the stamen of the crocus satimus, yes- the flower! It provides a delicious flavor as well as a bright yellow color to any dish it is added to and a little goes a long way! Saffron is hand harvested, so I'll admit, it's spendy, but a bottle of saffron will last a long time and as it's dried, it won't go bad. The final specialty ingredient, and arguably the star of the show, is the short grained Spanish paella rice which cooks quickly and absorbs a lot of liquid. When the dish is complete, the rice is dry and the grains have structure, and it isn't creamy like arborio rice used in risotto. I've never tried using a short grained rice other then paella rice in any paella dish I've made, so I don't know how, any other short grain rice might work as a substitution. This is paella after all, and the rice is key to the overall dish, so just order a bag online or find it locally and do it right- trust me, you won't be disappointed! Yep, the bag says it all! Smoked Turkey Paella- serves at least 8! In a sauce pan, bring the chicken stock and saffron to a slow simmer, keep hot. Meanwhile, using a heavy bottomed skillet or Dutch oven, heat the oil over medium high heat and when hot, add the onion and saute until translucent, about 5 minutes. Add the bell pepper and saute another 2-3 minutes. Add the diced tomatoes, smoked paprika, and minced garlic to the pan and bring to a simmer. Reduce to medium heat. Add the two cups of paella rice and stir to coat the grains. Once they are coated, add the stock and stir to fully combine. After that- let it sit, resist the urge to stir it! One of the most flavorful aspects of paella is the socarrat, a crusty caramelized crust that forms on the bottom of the pan as the paella cooks. After about 10 minutes add your diced chorizo, shrimp and turkey. You can work the meats into the rice a little, but take care not to disturb the socarrat. After all the stock has been absorbed, approximately another 10-15 minutes, remove from heat and cover with foil. Allow the paella to sit for 8-10 minutes before serving. Bring the whole pan to the table and serve straight from it being sure to scrape up some of the delicious socarrat from the bottom to go with each serving! Bon Appetit and be sure to let us know what you think of this recipe!